Eve Ewing, AB’08—sociologist, writer, poet, and Twitter star wikipedia brown—studies racism and inequality in public schools. 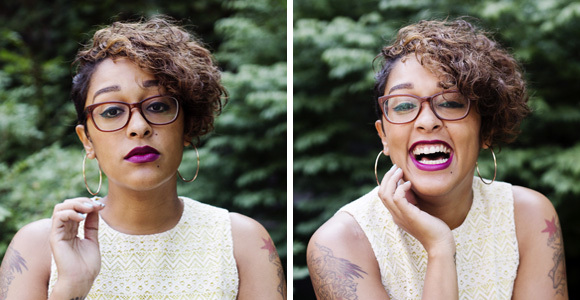 As a high school senior, Eve Ewing, AB’08, applied nowhere but the University of Chicago. “I was like, ‘Well, hopefully this works out,’” says Ewing, who later earned her doctorate from the Harvard Graduate School of Education. She’s now a Provost’s Postdoctoral Scholar at the School of Social Service Administration; she will join the faculty as an assistant professor in 2018. A sociologist of education who studies racism and inequality in urban public school systems, Ewing is also an essayist, poet, visual artist, and avid user of Twitter, where she’s known as wikipedia brown. What were your own school experiences like? Why did you apply only to the University? Well, I didn’t have a counselor helping me with applications, and I was raised by my mom, who didn’t go to college. I was presumed to be a good student who would just figure this stuff out. All this stuff was really foreign. After graduation you taught in the Chicago Public Schools. How did that lead to a career in sociology? I taught sixth, seventh, and eighth grade in Bronzeville, and it’s one of the things I feel most honored to ever have done. However, it’s a job that can be demoralizing because every single day you’re trying to do the right thing for the young people in front of you, and every single day you’re aware that there are other people somewhere who are not doing right by them. That’s why I left, because I felt I needed to learn more about the forces that were influencing my classroom. The big one is that my school was closed in 2013 as part of a wave of closings across the city. The CEO of the district said, these schools are so terrible. I felt she was telling a lie about my school because my school was a place of light and happiness and community. I felt that because it was a school on the South Side, she was preying on stereotypes so that people were happy to see it closed. My dissertation research was about unpacking that sentiment. Basically, the schools were closed based on the idea that they were underutilized. The argument was that these buildings were built to have a certain number of students in them, and if they didn’t have that many students, it was wasteful. Well, if you go to the Lab Schools, having a small student-to-teacher ratio is considered a great thing. Why is it that when it comes to CPS kids, the way we measure the goodness of a school is how efficiently we’re packing bodies into a building? How have you come to have more than 30,000 followers on Twitter? I really don’t know. I’m pleased and a little bit puzzled that so many people invite me into their phones and onto their computers. The thing I like so much about Twitter is that people I’ve never met feel like they have a relationship of trust toward me. So when I talk about things that are scholarly or academic, they’re invested because of the conversation we had last week about their moisturizer or the new Ghostbusters movie or whatever. I think being active on Twitter also helps demystify the idea of the academic as this high-and-mighty person in the ivory tower. I want to be able to talk about what I do with all kinds of people. How do you handle the stress of constantly thinking about racism and inequality? When I was writing my dissertation, one of the sources I used was recordings of kids saying why their school should be left open—just children crying into a microphone saying, “Please don’t close my school.” And then the school would get closed. So, yes, it gets overwhelming and depressing. How I deal with it is, number one, I’m very proud, as a black writer and a black scholar, to come from a tradition of resistance and critical inquiry. I take courage from people like Ida B. Wells, Audre Lorde, and W. E. B. DuBois. If Frederick Douglass couldn’t give up, I don’t have any reason to complain. Also, the things I write about are from my life and the lives of people I love. So I’m deeply invested in doing the work, even when it’s hard. The more practical answer is that I know when to step away. Racism is still going to be there tomorrow. Tomorrow, America is still going to be in shambles; I am confident about that. If you go watch Project Runway for an hour, white supremacy is still going to be there when you get back.